Cracker Barrel Introduces New Macaroni & Cheese Dinners! 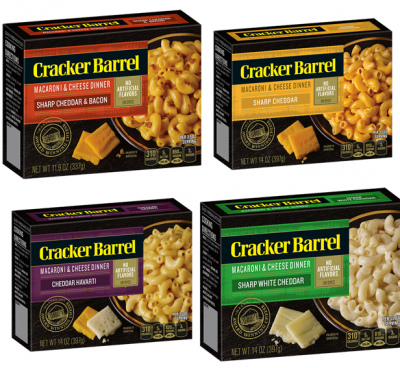 You are here: Home / Expired / Cracker Barrel Introduces New Macaroni & Cheese Dinners! This post was sponsored by Cracker Barrel Cheese. All opinions are our own. Cracker Barrel Cheese is shaking up the boxed dinner aisle with a new premium Macaroni & Cheese using award-winning cheddar, and free of artificial flavors and dyes! There are four yummy flavors, Sharp Cheddar, Sharp White Cheddar, Cheddar & Havarti (sharp & creamy together sounds so good!) and finally Sharp Cheddar with Bacon (love this combo!) How wonderful to bring the great taste of Cracker Barrel Cheese to these convenient new dinner mixes! To help you discover these new dinners Cracker Barrel is offering you $1 off coupons for Cracker Barrel Macaroni & Cheese! To receive the coupon, you can visit the Cracker Barrel Cheese Facebook page, snap a pic of an old trophy, medal or ribbon and share with and post the picture to the brand’s wall using #TrophyExchange #Giveaway. Coupons can be redeemed through June!